Cops off campus! Stop the criminalisation of students! Here are a few meetings we are taking part in over the next week to discuss this attack on our right to protest and how we can fight back – hope you can come along! 5 Sussex students have been suspended indefinitely for being involved in the student support of the recent staff strike and in the campaign against privatisation. Students occupied Bramber House in support of the strike, and left peacefully to join the picket lines on Tuesday. 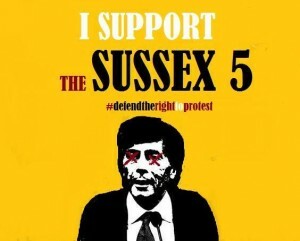 Management are trying to intimidate and deter the entire Sussex community from demonstrating their right to protest. Come to Falmer Common room at 6pm to join in the open debate about the crackdown on student protest, and how we can fightback against it. This is an open meeting in the JCR at 5pm on Tuesday in which students and staff can discuss the criminalisation of peaceful protest on our campus and how we take our campaigns forward at SOAS. Over the last few months University of London (UoL) Management has cracked down on student protest. This began with the arrest and of, and ongoing case against, a student for chalking 3 Cosas campaign slogans on Senate House (chalk washes off), after which protest was banned on Senate House grounds. Since then, police presence during student protests on UoL campus has dramatically increased, as has violence inflicted upon students. Daniel Cooper, ULU Vice-President, was arrested during a police raid of the Students Union, forcibly searching and racially profiling students. Michael Chessum, ULU President, was arrested after a Save ULU demo for not notifying the police about the protest on UoL campus. We have never had to notify the police about protests on our University campus, nor should we. Last Wednesday a network of 100 independent students from different universities occupied the offices of senior UoL management, including that of the Vice-Chancellor Adrian Smith. After 5 hours the police forcibly and violently evicted these students and arrested 5 in the process. The legality of their actions is questionable as students were not given the option to leave peacefully, and did not do anything to warrant arrest. (The Guardian and other media outlets have videos of police brutality towards students – http://www.theguardian.com/world/video/2013/dec/05/police-officer-punches-student-university-london-protest-video ) During a peaceful protest against this increasing police presence, and the assault and arrest of students the previous night, (known as ‘Cops off Campus’) protesters were purposefully chased by the police off campus, to Euston Square, where they were kettled and arrested en masse. These arrestees included students, university staff, Union representatives, members of the press, legal observers, and even passersby, including an injured person on their way to hospital. The kettles were outside the Hospital, obstructing ambulances. UoL has obtained an injunction, banning occupations on UoL campus, including Senate House, SOAS, and Birkbeck. Around the country we have seen similar scenes: five students were suspended at Sussex University and in Birmingham and Sheffield occupations were broken up by police. This recent wave of crackdown on demonstrations in universities is taking place on the backdrop of austerity, and an accompanying attack on our right to protest – from mass arrests at anti-fascists demonstrations, and racist stop and searches, to the murders in police custody and the killing of Mark Duggan, and now cuts denying legal aid to protesters. This is a mechanism to uphold the status quo, which has been extended to universities with the increasing privatisation and the marketisation of higher education, whereby students are expected to act as compliant consumers, who should not be critical, and do not have a right to political expression and assembly. The campaings that UoL management want to suppress are around the defence of public higher education, opposing the selling off of student debt, the closure of ULU, and the right to protest, and the fight for staff’s fair and equal pay and conditions. Followed by open discussion. After the meeting there will also be a ‘know your rights’ session! This entry was posted in Defence Campaigns, In Education. Bookmark the permalink.